I always tell my daughter how much love she has in her heart, how important it is that she holds onto that and how it will allow her to make the best decisions always. This is a sort of visual representation of this lesson. I went to the best tattoo shop in my city, looked at the portfolios and felt confident they could make my design work. I made an appointment for consultation since what I wanted was a custom design. 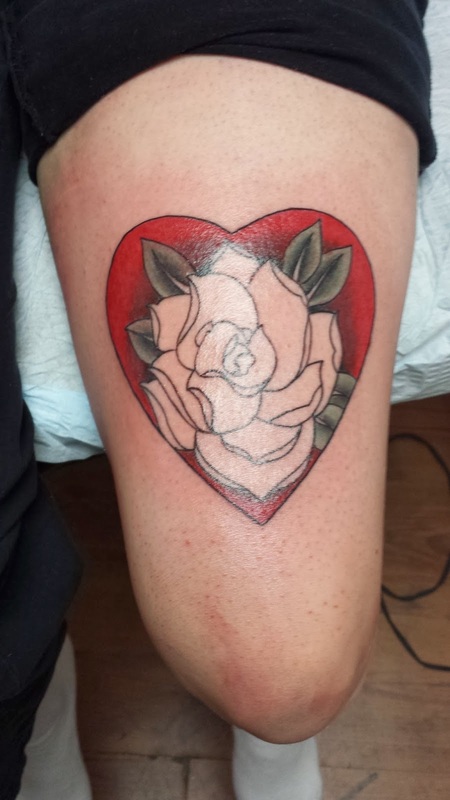 I told him my general idea when I took the appointment and at that point, I was thinking of getting either a heart with two flowers beside it or a heart with a flower inside it. I continued to think about it before the consultation and figured out that it would be a better design to have a flower inside the heart. 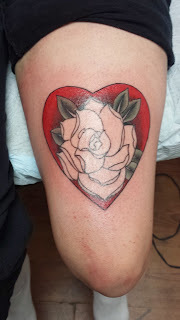 When I arrived at the consultation, my tattoo artist had sketched a heart and flower and had come to the same conclusion I had about the design! He then told me it would be nice to have the flower a colour that would pop, and I already knew I wanted yellow - another sign that we were on the same page with this! 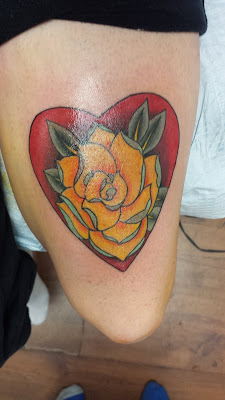 From there, we discussed a couple details and made an appointment for the real deal - the ink! Second step - putting the stencil on; we got it the first try! 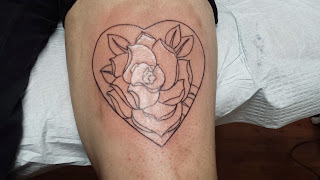 He started with the outline and I hardly felt anything at all at first, especially on one side of the design. By the end of the outline, I was glad to be moving onto something else but it was plenty bearable. Phew! He then did a bit of black shading behind the flower and in the leaves, coloured in the leaves, did the burgondy red, then the brighter red. Then for the flower he did the orange shadows first, the yellow petals and then the turquoise highlights in the petals. The whole process was a bit more than 2h but the needle time was maybe 1h 45. It felt like less honestly and though I was very glad to be done at that point, I wasn't suffering so I'd say it was painful but not terribly painful - it was pretty easy to tolerate. I should mention that it kept bleeding during the process, my yellow was looking orange the whole time from the mix of blood, but it was like mini-drops seeping through the needle holes, it was never enough to form an actual full-sized drop. It was just enough to have me worried for a bit until the tattoo artist told me this is completely normal. It has only been a couple days so I have no post-tat care advice or any thoughts about living with this tattoo, but I can tell you what I learned along the way. 1) Finding the tattoo artist: Get a tattoo artist you trust and has a good portfolio that excels in the style you want. Don't make price your criteria for choosing an artist. 2) My tip is to start with *where* you'd want a tattoo. That might narrow down *what* you can get depending on the location you chose. 3) Size. You don't want your tattoo to be a blob of something so if you want it to be small, keep in mind you cannot have much detail. If you want lots of detail, keep in mind you will need to get a bigger tattoo. 4) There's nothing wrong with a tattoo that isn't personally or spiritually meaningful! Some people's first motivation is for the tattoo to have meaning, the second one being aesthetic. Some people's first motivation is adornment, with the second being meaning if at all. All of that is OK. You might want to figure out where you stand on it all. 5) Decide what you want. When you're really sure, here's another tip which is the complete opposite of what others might say... If your friends and family's opinions are important to you, run your final idea by them. Your reaction to their reaction should either cement your idea or make you think it over a second time. If it's the latter, you'll know that if you decide on this design anyway you won't be disappointed in a bad reaction since you already know that they aren't fond of it. Don't get influenced by their reaction to early, "rough draft" versions of your ideas though because they'll be telling you their preferences at this point, but when they know you've chosen, they should be more careful with their reaction, which will be closer to what you'd get with a real tattoo. 6) Dealing with pain: Relax your body and try not to tense up! Also I kept looking at stuff around me and focusing on noticing things, also talking, etc and time passed much faster. You did it!! It looks amazing! !